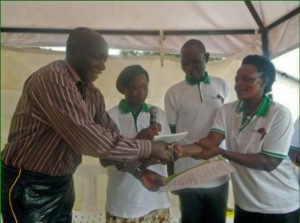 Rehema Namyalo, Andrew Kyambadde and Evelyne Nakamatte have concluded their intensive training seminar in self-reliance in health and welfare in Kabongezo Village, Mityana District, Uganda. 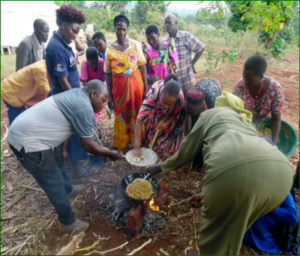 The group learn how to prepare the local food bagiya and crisps – both are ideas for income generation. The Chairman of the District made a closing speech and presented certificates to the seminar participants. The seminar group benefited from the participation of George Zokli. George is a valued partner of Discover in Ghana. He shared his extensive knowledge of moringa and how to make a delicious and nutritious moringa drink. The next such training seminar will be held in Nakaziba village, Mityana District, from 26 August to 1 September inclusive, arrivals on 25 August. This provides other organisations with a wonderful opportunity for their project members to receive excellent training at a very modest cost. Read the invitation. The work of Discover in schools: Many Discover members in Uganda are active in primary schools. During our recent visit our partners introduced us to no less than 10 schools. Read a summary of this work. Bwambale Vincent, a 14 year old pupil at St John’s Primary School, Maliba, Uganda, has written this super report about how he is enjoying and benefitting from the Discover group in his school.